Over the past decade, I’ve started noticing something: When the Republican Party was out of power, they threatened armed insurrection. And now that they’re in power they do it even more. This is a serious problem. For a long time, the gun control debate has made little sense, even to many gun lovers. How does a basic level of gun safety interfere with our Second Amendment right to bear arms? Why does the GOP so staunchly support the National Rifle Association (NRA)’s extreme stance? Perhaps because adopting their stance is not only profitable, it’s convenient. For them, the Second Amendment is all about preserving what they see as their God-given right to armed insurrection. See what he did there? It’s called false equivalence. There’s a difference between the white supremacist “Unite the Right” rally goers — some of whom came heavily armed — and those who came to oppose them. GOP leaders won’t admit it, but as far as they’re concerned, threats of armed insurrection are encouraged, or at least tolerated, because they serve their anti-government agenda. The angry, torch wielding Neo Nazis converged on Charlottesville because its City Council voted to take down a statue of General Robert E. Lee, a traitor who led the Confederacy’s rebellion over the issue of slavery. The protesters came to support and show solidarity with the people of color who see the statue and the Confederate flag as symbols of terror, slavery, and genocide. Then, as now, the ideological ancestors of today’s Republican Party sought to preserve practices the rest of the civilized world viewed as barbaric and were prepared to wreak violence and havoc in order to do so. A woman died amid the violence as a car driven by one of the white supremacists rammed into the crowd. Two police officers died as well and 35 people were injured. But all Donald Trump can say is that he condemns racism but not the actual racists. 14 times prominent Republicans have threatened armed insurrection. Is that an armed insurrection in your pocket, or are you just glad to see me? While the GOP’s president claims to condemn the “many sides, many sides” of hate, racism, and white supremacy, the Republican Party seems to do an awful lot to support it. For starters, they constantly howl about so-called “terrorist threats” from Muslims, but enact no laws to make us safer. On Aug. 3, the NRATV — the National Rifle Association’s video channel — tweeted out a terrifying rant from Dana Loesch. Guns and shooting are never once mentioned in this ad, but they don’t need to be. This is the NRA, after all. Plus, the “clenched fist of truth” alone sounds rather menacing. How do we deal with Islamic terrorism here in America? A former sheriff and current congressman from Louisiana has an idea. He says we should “kill them all. “The free world… all of Christendom… is at war with Islamic horror,” he declared in a Facebook rant on June 2017. Not one penny of American treasure should be granted to any nation who harbors these heathen animals. Not a single radicalized Islamic suspect should be granted any measure of quarter. Their intended entry to the American homeland should be summarily denied. Every conceivable measure should be engaged to hunt them down. Hunt them, identify them, and kill them. Kill them all. For the sake of all that is good and righteous. Kill them all. Clay Higgins has over 200,000 followers, and the post was shared thousands of times. 12. Michigan GOP official Dan Adamini calls for shooting protesters. When U.C. Berkeley students didn’t want their tuition dollars funding alt-white Milo Yiannopoulos’ snarky, racist bile, thousands of students protested and a smaller group shot fireworks. The speech was canceled. Dan Adamini’s response? Never mind that most of the protesters were peaceful and had every right to object to spending public university money on a well-known white supremacist and provocateur. Never mind that we heard nary a peep from any Republican officials or lawmakers during the 41-day occupation and armed insurrection at Malheur Wildlife Refuge in Oregon over federal land management policies. 11. Donald Trump implies “Second Amendment people” can off Hillary Clinton. At his campaign rally in Wilmington N.C. In August 2016, Donald Trump made a barely-veiled call for gun violence against his then-rival Hillary Clinton. That’s right. When a Republican candidate wins, we’re all supposed to accept it — even when his opponent won the popular vote by 2.8 million. But when a Democratic candidate wins, you’re allowed to shoot her. That’s right. 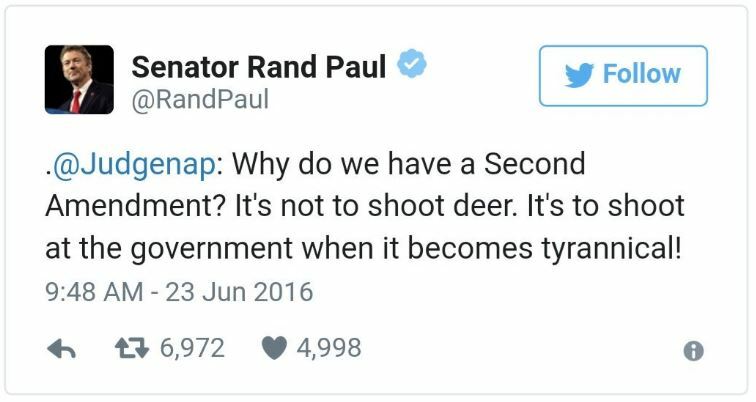 When the majority of Americans vote to have rich people to pay their fair share in taxes like they used to in the America Republicans want to “make great again,” Rand Paul thinks our nation’s small minority of hard-right conservatives should have the right to shoot them. In other words, the GOP’s insanely broad definition of gun rights is so a small minority of people in our country with these views have the option of mounting an armed insurrection against the U.S. government. 9. Rep. John Bennett (R-Okla.) wants Hillary Clinton shot by a firing squad. Never mind that House Republicans are the ones who forced funding cuts for U.S. Embassy security, but no one’s threatening to murder them or throw them in jail. This goes to show: If you’re serving your country abroad and work for an administration the GOP doesn’t agree with, patriotism be damned. They’ll let you die a death by a thousand budget cuts, and then blame the Democrats. 8. Making Machine-Gun Bacon with Sen. Ted Cruz (R-Texas). We then see him at a gun range, presumably in his kitchen, wrapping bacon around the muzzle of a machine gun, wrapping it in foil, then shooting a few rounds to cook it. Mmm, mmm, good. No one likes paying taxes, but on Sept. 16, 2015 Sen. Rand Paul (R-Ky.) took it to a whole new level. While visiting Simi Valley, Calif. for one of the GOP debates, Paul dropped by a shooting range and shot a massive pile of paper full of holes. Our federal tax code is complicated, but Republicans more and more seem to hate dealing with complicated things. Why bother solving problems when you can just shoot at them? 6. Sen. Mitch McConnell brandishes a rifle at CPAC. In March 2014, Sen. Mitch McConnell (R-Ky.) kicked off a speech at the annual Conservative Political Action Committee conference by waving a rifle aloft. NBC reports he then presented it to Sen. Tom Coburn (R-Okla.), who’d won the “Courage Under Fire” Lifetime Achievement award from the National Rifle Association. He wound up successfully defending his Senate seat against his then-Democratic challenger Alison Lundergan-Grimes, but she managed to work in a sly dig via Twitter. Of course, Mitch McConnell denies he meant anything by it, but it sure looks like a call for armed insurrection to me. Here’s the video with CNN’s Anderson Cooper reporting on this highly disturbing moment. 5. Sen. Joni Ernst (R-Iowa) unloads on Obama(care). Gun culture’s one thing — after all, liberals love their guns, too. But this amounts to a threat of armed insurrection. Barack Obama won the 2008 election in a landslide because a vast majority of voters wanted healthcare reform. Furthermore, Republicans shouldn’t have objected as the ACA is a market-based healthcare solution based on a plan by Mitt Romney, a GOP governor of Massachusetts. 4. Rep. John Sullivan (R-Okla.) declares he can only fix the U.S. Senate at the barrel of a gun. According to The Oklahoman, he later apologized for his comments. Here’s the video footage via Talking Points Memo. 3. 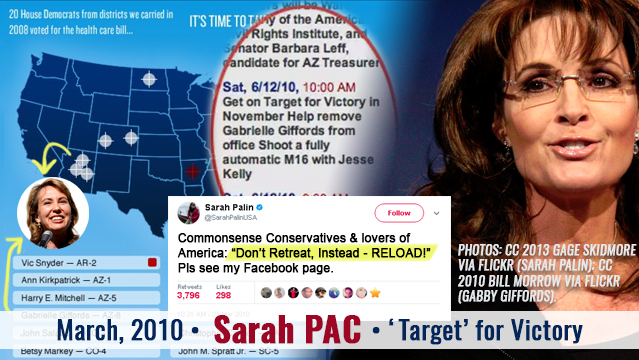 Sarah Palin targets then-Rep. Gabby Giffords (D-Ariz.). Commonsense Conservatives & lovers of America: Don’t Retreat, Instead – RELOAD!” Pls see my Facebook page. On Sarah Palin’s Facebook page was a list of events including the June 12, 2010 event in Gabby Giffords’ district. Get on Target for Victory in November. Help remove Gabby Giffords from office. Shoot a fully automatic M16 with Jesse Kelly. Meanwhile, the districts with House Democrats being “targeted” were marked with crosshairs. As we all know, Gabby Giffords was shot and disabled the following year by Jared Hough. He was a mad man and likely wasn’t influenced by Sarah Palin. Still, this is what we get when we encourage a culture of gun violence and treat it like a joke. In Jan. 2010, Sharron Angle, a GOP Assembly member and candidate for U.S. Senate from Nevada, told the radio talk show host Bill Manders there are “Second Amendment remedies” if we can’t rein in Congress. She stopped short of a call for armed insurrection but came pretty danged close. Here’s the audio clip from The Las Vegas Sun. In August 2007, Rolling Stone reported rock star Ted Nugent threatened violence against then-White House hopefuls Barack Obama and Hillary Clinton while chatting up concert goers onstage. The incident came up again when Fox’s now-disgraced Eric Bolling ripped into comedian Kathy Griffin for her gory Photoshopped selfie with her holding Donald Trump’s severed head aloft. But he gave Nugent a free pass for his 2007 comments and even had him call in to explain why his 2007 death threats weren’t as bad as Griffin’s photo. Here’s the video clip from Media Matters. Featured image: Composite (L-R) with video screen grab 2015, “Rand Paul Shoots an AR-15 at the Tax Code” via YouTube); CC By-SA 3.0 2014 Gage Skidmore via Flickr (Mitch McConnell); video screen grab 2014, Joanie Ernst “Shot” campaign ad via YouTube; video screen grab 2015 Ted Cruz, “Machine Gun Bacon,” The Independent via YouTube); Public Domain 1999 C-SPAN video screen grab via Wikimedia Commons. and CC By-SA 2.0 Gage Skidmore via Flickr (background).